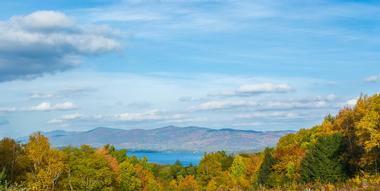 Lake George, nicknamed the Queen of American Lakes, offers outdoor fun in the Adirondacks year round. During the summer, visitors can enjoy water sports, biking, and camping along with the local beaches, amusement parks, and events such as fireworks and the motorcycle Americade. Spring or fall is the perfect time to do some whitewater rafting, horseback riding, or hiking, and during the winter there is the Lake George Winter Carnival Festival, or visitors can try their hands at ice skating, snowshoeing, snowmobiling, and skiing. On rainy or colder days, stay indoors and partake in the area’s many attractions and shopping venues. This hiking trail up Buck Mountain ends at the summit, which presents an expansive, tranquil view of the surrounding greenery, islands, and villages below as well as the peaks of the Adirondacks. The trail was deemed ‘a perfect introduction to the Adirondacks’ by Barbara McMartin, who authored 50 Hikes in the Adirondacks, and it provides a moderate hike that stretches 3 miles each way. The hike has difficult parts, and hikers are cautioned to follow the yellow markers. The trail is open all year round, and hikers can bring their dogs on a leash. Free parking is available at both the Pilot Knob and Hogstown trailheads. 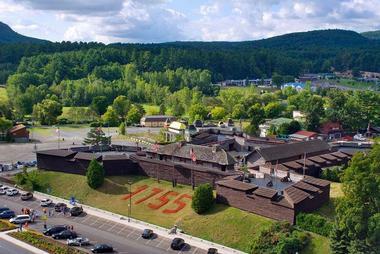 Fort William Henry was built in 1755 as a British outpost and a barrier to the French stronghold at the northern end of Lake George. The fort allows visitors to experience life at a wilderness outpost, complete with guides dressed in era-appropriate attire who discuss military tactics and weaponry as well as the critical role of the fort’s women in keeping the fort occupants alive. When you enter House of Frankenstein, your senses come alive through the sounds and sights of these scary wax and animatronic creations. The museum is open for self-guided tours, and you’ll find 52 exhibits, such as the Hatchet Man, Ant Torture, the Colossus of New York, Strange Planet, and more, with many of the exhibits coming to life at the press of a button. The exhibits are not for the faint of heart, and staff discourage letting younger children into the attraction. People who consider wax museums to be a tame and old-timey attraction may not have visited this particular one. Allow a minimum of 30 minutes to walk through and experience the various exhibits. » Lake George Steamboat Co.
© Lake George Steamboat Co. 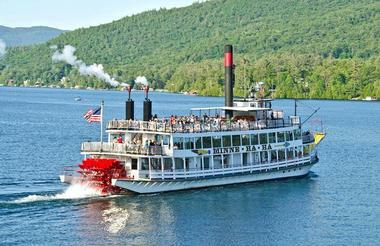 Established in 1817 by the New York legislature, today the Lake George Steamboat Company offers daily cruises on their three ships: the Minnie-Ha-Ha, a rare remaining example of a steam paddle wheeler; the Mohican, which has been in continuous operation over its 108-year history; and the Lac du Saint Sacrement, the largest (190 feet in length) cruise ship operating in inland New York State. Lakefront cruises run seven times daily and last an hour, while meal, specialty, entertainment, and sightseeing cruises can run longer, up to 2.5 hours. The ships are also available to rent for private parties and events. Magic Forest is targeted at families with younger children, but is also entertaining for adults. The amusement park has 19 rides for children and four for adults as well as a train that runs through the forest and a tram that traverses Safari Land. Magic Forest holds magic shows and a daily diving horse attraction, although today Lightning is the only remaining diving horse. The park’s petting zoo is small but fun for all ages, and taking the Fairy Tale Trail brings you past cottages and attractions that recount famous fairy tales, such as the Hansel and Gretel or the Three Little Pigs. Well-shaded throughout, Magic Forest has a picnic area and a snack bar where you can rest and refuel. The most famous and largest of Lake George’s beaches, Million Dollar Beach features showers and changing rooms, picnic areas with grills and a snack bar, a volleyball court, and a public boat launch. The beach is free and there are lifeguards on duty. Parking is paid and varies based on time of day and vehicle type. If using the boat launch, stop by the boat inspection and wash station first. The beach is open on weekends starting Memorial Day, and daily from the third Saturday in June to Labor Day. The hours of operation are 9 am to 7 pm for the beach and 10 am to dusk for the picnic area. 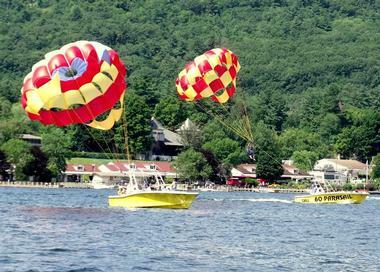 Parasailing Adventures has been rated the #1 summertime activity at Lake George for three years since 2009. The company runs parasail rides on Lake George and has a 100% safety record and a 98% customer approval rating. Clients can take a speedboat ride while waiting their turn; parasailers ride two or three people abreast, though the boat can hold larger groups if necessary. The company provides amenities at the marina for before or after a flight, such as changing rooms, bars and dining, and restrooms. Customers can park for free at the marina. Open daily from 8 am to 6 pm. 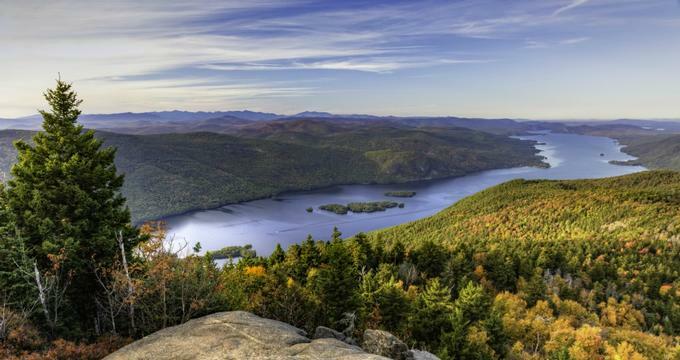 With a 2030-foot summit, Prospect Mountain offers visitors a breathtaking view that ranges over Lake George and the surrounding Adirondacks all the way to Vermont’s Green Mountains. The mountain is reachable by car using the Veterans Memorial Highway. At the summit, visitors can use paid parking and walk the mountain’s trails or hop on the shuttle that journeys up to the mountain’s peak. The summit also features picnic areas and restrooms. 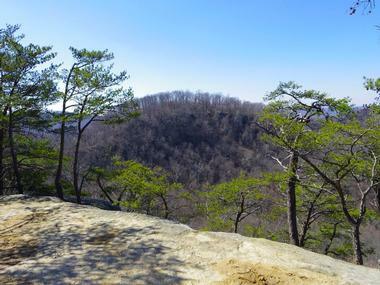 Prospect Mountain is popular with hikers, and is considered an easy to moderate climb. The trail is simple to follow and runs 4 miles each way. Note that the hike is deemed unsuitable for small children. Open 10 am to 5 pm in season. Hiking Shelving Rock Falls is ideal for novice hikers, with a trail that runs down Shelving Rock Mountain alongside active 50-foot waterfalls towards Lake George. The path is steep in spots and rocks can be slippery depending on weather conditions, so caution is still required. To access the trail, visitors can either take a boat into Log Bay, a popular boating bay, or drive and start from the parking lot. Hikers should bring their bathing suits so they can cool off afterwards with a dip in Lake George itself. As a bonus for those who enjoy geocaching, the hike also features geocaches. The Warren County Bikeway trail is a charming 9-mile ride through the woods that runs between Glenn Falls and Lake George. Signs along the trail provide information about points of interest and historic locations, such as 19th-century industrial areas, the Delaware and Hudson (D&H) railway train tracks, and Lake George Village. The bikeway features trail-side restaurants, pubs, and shops like Coopers Cave Ale Company and Sprinkles, where you can stop for a break and refreshments. The trail also passes grand homes and the local country club. On the way, keep an eye out for wildlife and flowers, both on land and in the water. Both the Glenn Falls and Lake George trail-heads are accessible from Route 189. Lake George Steamboat Co., Photo: Lake George Steamboat Co.